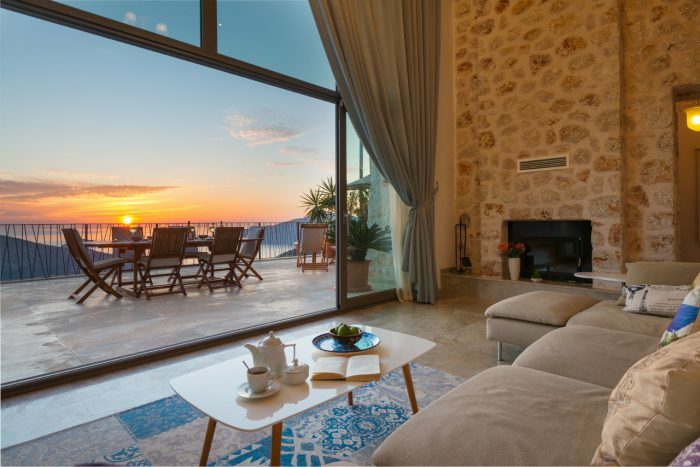 For parties of up to ten looking for a magnificent villa to stay near the enchanting harbour town of Kalkan along Turkey’s beguiling Lycian Coast, then feast your eyes on Manzara. This stunning stone-built villa is comprised of three double bedrooms, two twin bedrooms and five bathrooms. Nestled on the hillside of a steep slope, Manzara boasts tremendous views of the invigorating coastline that lies before it, where the azure water of the Mediterranean gently clings to the pretty bays, calming coves and desirable harbours that twist and bend around one of Turkey’s most beautiful stretches of coast. Manzana is tastefully designed over three floors, each storey and room exuding taste and style with minimalist décor and contemporary furnishings. All the spacious, modern bedrooms are en-suite and have air conditioning. Lucky guests staying in one of the second-floor bedrooms can enjoy relaxing in their own sauna. This truly remarkable villa makes the most of the breath-taking views that stretch in every direction. An infinity-edge private swimming pool merges effortlessly with the landscape that surrounds it, vying with the cloudless sky above and the glistening sea below in the brilliant blueness stakes. Adding further tantalisation to this striking infinity pool is the jacuzzi that sits alongside it, surrounded by ultra-comfy loungers – the perfect place to sit sipping a glass of wine whilst watching the sun slowly set in this remarkably beautiful part of the world. Al fresco dining is a pleasure few guests could resist when staying at Manzara, with steps leading up to spacious living/dining terraces. A large stone dining table and barbecue make cooking and eating amidst this magnificent vista comfortable, convenient and irresistible. It could be tempting to spend your whole holiday in the luxury confines of Manzara, but you’d be missing out on exploring the charming town of Kalkan that’s just 4km from the villa. This upmarket coastal town has long attracted visitors seeking a taste of authentic Turkey set amongst the most beautiful of vistas. A series of quality restaurants, trendy cafes and exclusive boutiques mean foodies, wine connoisseurs and shopaholics will all be at home in this sought-after yet traditional Turkish town. For more information about the remarkable villa of Manzara, to view photos and make a booking, visit the property’s webpage here.